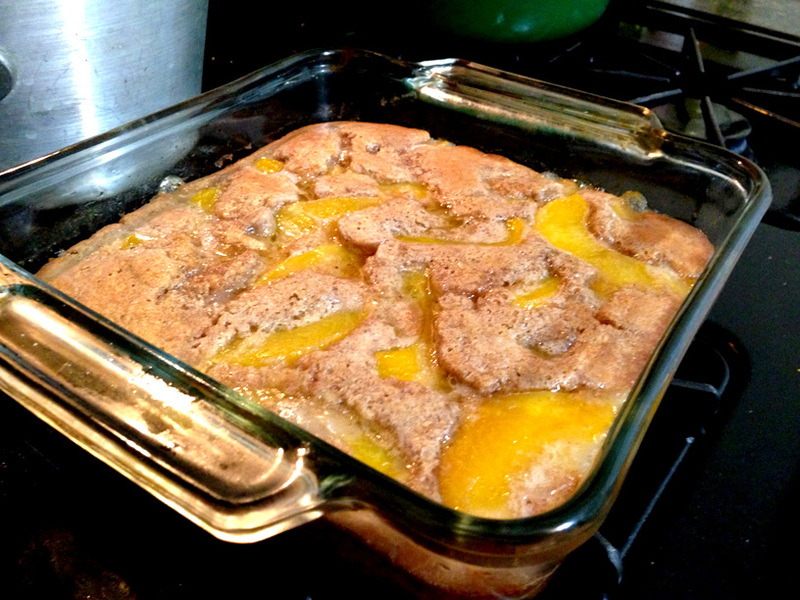 If you’ve got a can of peaches, you can make this cobbler! So it’s 9:00 pm, I have a big interview tomorrow, I had a really long day today, but I was craving something sweet. Now I have been tweaking my chocolate mug cake recipe, but it has yet to give me that “oomph” that I am looking for, so I shelved it. Then I remembered that I had two jars or peaches on my shelf, and thought, cobbler. If you have a southern grandmother or have ever been to a buffet, then you have had cobbler. Peach cobbler is Soul Food’s Apple Pie. It isn’t difficult, but if not done right, you may as well be eating cardboard and canned peaches. I know some people get down and dirty, fresh peaches, rolled dough, fresh grated cinnamon, etc…*cough…show off!…cough* I like cobbler, especially warm, with some vanilla ice cream and maybe a spot of whipped cream even. What I do not like is the rolling, and peeling and all of that other stuff. I can be #lazy at times. I believe I owned up to that two or three posts ago and we have all moved on. 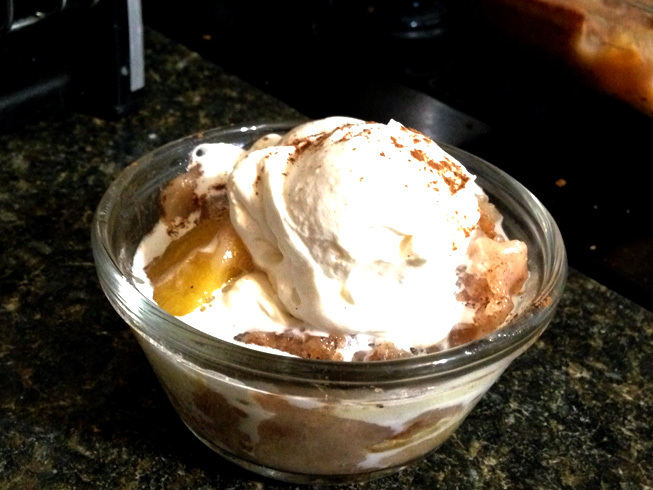 So, in another homage to lazy cooking, I present to you my recipe, tweaked from several other recipes, for peach cobbler! By creating a batter, that literally bakes up and around the peaches, I’ve bypassed the need to make a crust and roll it out. Instead, the peaches are laid on top of the dough and melted butter, then baked. This recipe is so easy, your husband could make it!! Seriously, the hardest part of this recipe is waiting for it to cook. 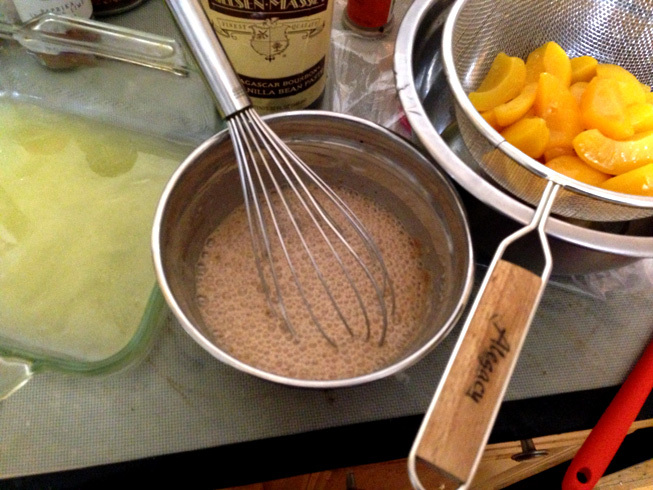 I have used this to make blackberry cobbler, peach cobbler, apple cobbler…you get the picture. Works with virtually any kind of fruit. As with every recipe I post, I encourage you to not just try it, but experiment, make it your own, enjoy yourself. Then leave feedback! Please and Thank You! Drain the peaches and save 1/2 of the juice. In an 8×8 baking dish, melt butter. If you use a glass pan, you can do this in the microwave, otherwise, stick the pan in the oven until butter melts. In a medium bowl, mix the flour, sugar and spices. Add milk, vanilla and peach syrup, mix well. 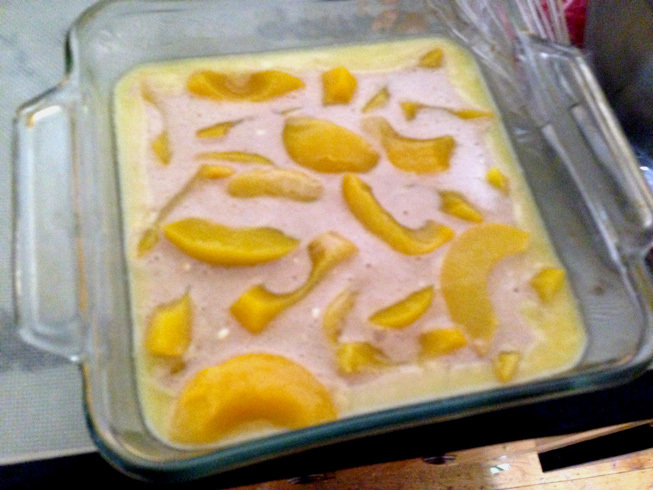 Pour the batter over the melted butter in the baking dish and arrange the peaches on top of the batter. Bake for 45 minutes to an hour. Once the batter rises over and around the peaches and the crust is thick, and has browned nicely, the cobbler is done. I served mines still warm with fresh whipped cream, because I did not have any ice cream! 2 Responses to "If you’ve got a can of peaches, you can make this cobbler!" Glad you tried and liked it! Next time just double the recipe then invite people over to share!